Introducing kids to circuit training can be a fun way to get children involved in physical fitness and put them on the path to a lifelong enjoyment of exercise. From simple games to more strenuous weightlifting, circuit training exercises should be adapted to the level of the children performing the circuit. If you want to get younger children physically active, take into account short attention spans by letting kids play games, compete against others or the clock, and keep score. Circuit training exercises for young children can include jump rope, hop scotch, throwing balls, jumping in the air, hula hoop, relay races, jumping jacks and dashes. Set up cones or other identifiable areas so children can move from station to station to see how much they've accomplished and how far they have to go. Tell the children prior to beginning the circuit what's going to happen at each station and what it will take to complete the circuit. As children get older and develop better hand-eye coordination as well as some muscular strength, challenge their cardiovascular system, speed, agility, balance and muscle strength. Goals for school-age children should focus on building aerobic fitness and weight control (if there is a weight issue involved). Create a circuit with simple calisthenics and familiar bodyweight exercises like jumping jacks, sit-up, push-ups, pull-up, chin-ups and jumping rope. Timed dashes are a good circuit exercise, as well as hop scotch, high-knee skipping, giant steps down the length of a driveway or the width of a gym, "suicides" or line-to-line back and forth running. Children can practice vertical leap by jumping next to a wall as high as they can with a piece of chalk in one hand, making a mark against the wall to see how high they can reach. Keep track of their results each week to gauge improvement. To keep heart rates up, time each circuit so that each child is working 30 to 60 seconds, with no more than a one-minute break between each leg of the circuit. Keep the circuit going for a minimum of 15 minutes. Play their favorite music loud during the workout to create more excitement. If the children have enough muscular strength, add weighted exercises like medicine ball throws, and dumbbell exercises like biceps curls, lunges, squats, triceps extensions and chest presses. 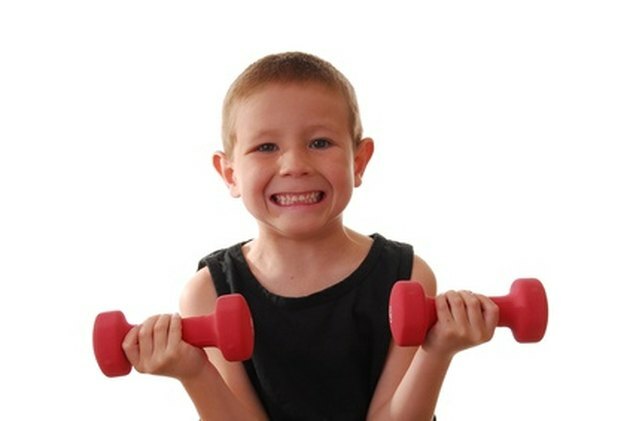 Use weights that the children can perform for six to eight repetitions before getting tired. Raise the level of intensity and duration of the circuit training exercises if the children are post-pubescent and more serious about a particular sport. The dumbbell exercises should be done with as much as 50 percent of the maximum weight they can lift, with eight to 10 repetitions per set. Many of these exercises can be done with resistance bands as well. The bodyweight exercises should be done more slowly, with attention paid to correct technique, including negative reps. Negatives are the downward moves of an exercise, such as lowering a barbell during a biceps curl, lowering the body from a pull-up or chin-up, or going back down to the floor during a sit-up or crunch. The negative portion is often overlooked, as tired exercisers let gravity drop their arm or body down, instead of using muscle to slow their downward movement. Add exercise machines to the circuit, like an elliptical, rowing machine, exercise bike or treadmill. A circuit training routine in a pool can include laps done with each stroke, such as the crawl, breast stroke, butterfly and sidestroke. Breaks between sets should be one minute or less, with the entire circuit lasting about 30 minutes.